BEAUTY AND THE BEACH! UNIQUE and RARE location on Longboat Key offers the best of BOTH! Sarasota Bay VIEWS & BOAT DOCK in your backyard and Gulf of Mexico Beaches with deeded beach access right across the street. LUXURY designer home NEW IN 2018 is one of 3 properties in the private WATERFRONT community called the"Enclave". 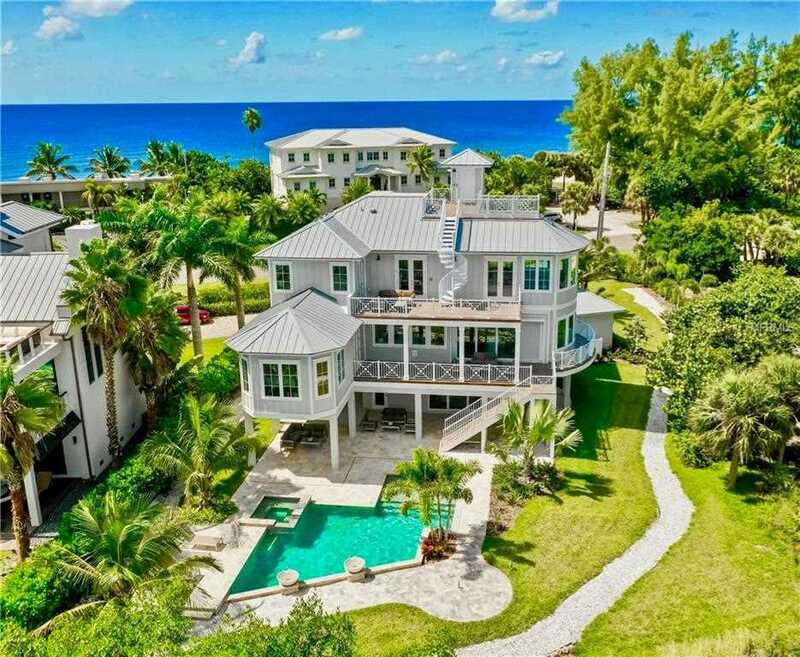 GORGEOUS British West Indies style designed by noted Sarasota designer Brian Phipps has 5 bedrooms all en-suite with 2 half baths and 4446 sq. ft. of living space. There are 3 separate living areas, the Master and bedroom #2 on 2nd level and 3 bedrooms on the 3rd level. NEED parking space? There is a 2 car attached garage and 2 car detached garage w/ parking up to 6 more cars! The hydraulic elevator has access from ground level to the roof top deck. All living areas have engineered hard wood flooring & oversized PGT custom doors & windows throughout utilizing AMAZING WATER VIEWS from most ALL rooms. Designer kitchen offers custom cabinetry, stainless steel appliances, Wolf 8 burner gas range, Sub-Zero refrigerator, two ASKO dishwashers, wine cooler, a separate ice maker and exquisite Brittanicca luxury series quartz counter-tops. Professionally furnished by local talent Adrian Griffin Interiors. The gorgeous oversized backyard enhanced with Travertine sundecks has heated pool and spa with Aqua-link technology, cascading waterfall bowls, and sun shelf. Exceptional design, quality & unique location make this a true waterfront escape where everyday living is a vacation experience! Lot Size: 1.18 Acres / 51228 Sq. Ft. Directions:Gulf Of Mexico Drive on Longboat Key to 3470. SchoolsClick map icons below to view information for schools near 3470 Gulf Of Mexico Drive Longboat Key, FL 34228. MFRMLS data last updated at April 24, 2019 5:28:39 PM PST. Home for sale at 3470 Gulf Of Mexico Drive Longboat Key, FL 34228. Description: The home at 3470 Gulf Of Mexico Drive Longboat Key, FL 34228 with the MLS Number A4415298 is currently listed at $3,675,000 and has been on the Longboat Key market for 200 days. You are viewing the MLS property details of the home for sale at 3470 Gulf Of Mexico Drive Longboat Key, FL 34228, which includes 5 bedrooms, 7 bathrooms and has approximately 4446 sq.ft. of living area.